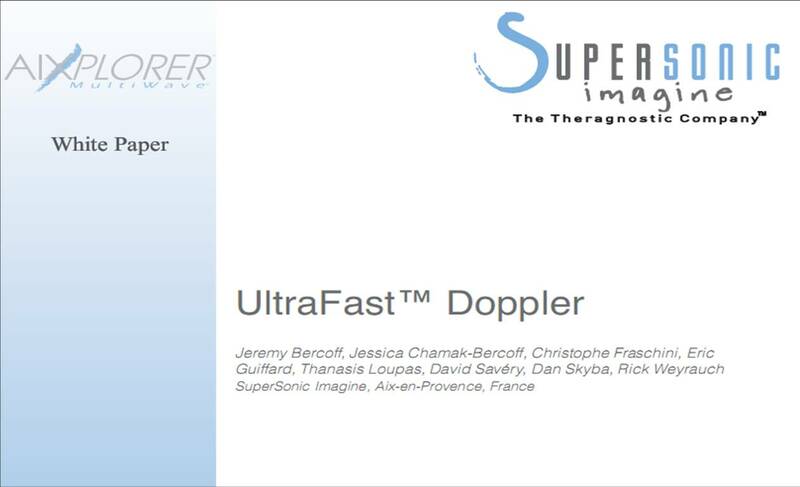 SuperSonic Imagine đã thông báo một kỹ thuật mới, UltraFast Doppler. 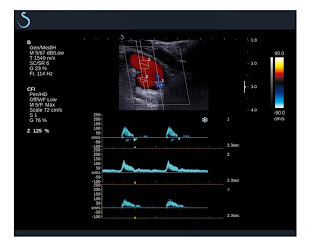 UltraFast Doppler kết hợp tạo hình dòng chảy màu (color flow imaging) với Doppler xung (pulsed wave doppler), bằng cách hợp nhất tạo hình dòng chảy (flow imaging) và định lượng (quantification). Điều này tạo ra các clips ultra-high frame rate color flow (dòng chảy màu có tốc độ khung hình siêu nhanh), nhanh hơn Doppler màu quy ước gấp 10 lần và điều này làm giảm artifacts. Qua color box, dữ liệu Doppler toàn bộ có thể định lượng, bằng cách tạo ra phổ xung Doppler post-processed tại mỗi ảnh điểm của image loop lưu trữ. Today, UltraFast imaging is being applied in new ways. As will be described in this paper, UltraFast imaging can be used to both visualize and quantify flow, hence combining the utility of color flow and PW in a single feature. In the context of flow analysis UltraFast Doppler provides high frame rates, high sensitivity and fully-quantifiable flow information over a large region of interest. 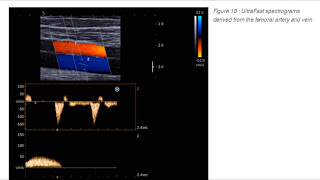 The reinvention of Doppler ultrasound through UltraFast imaging has a potential major impact on physician‘s workflow, examination time and diagnostic accuracy. 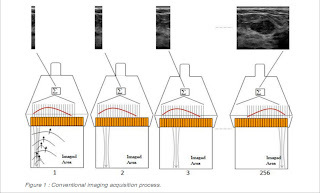 With or without multiline capabilities, current ultrasound systems are built on a serialized architecture and images are reconstructed sequentially from several equivalent transmits. UltraFast imaging represents a radical departure from this approach. An ultrafast imaging system is able to compute in parallel as many lines as requested and is therefore capable of computing a full image from a single transmit, irrespective of the image size and other characteristics. In such a system, the image frame rate is no longer limited by the number of lines reconstructed but by the time of flight of a single pulse to propagate through the medium and return to the transducer. 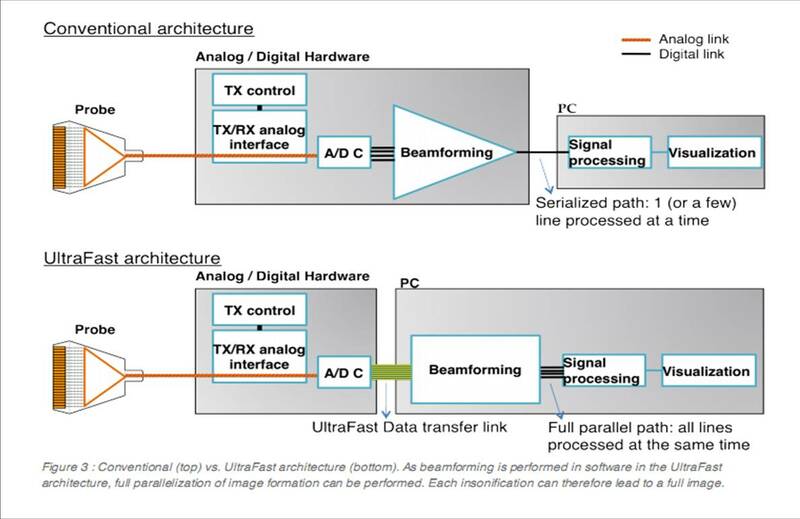 There are many ways to leverage an ultrafast imaging architecture (Lu, 1998; Jensen 2005). SuperSonic Imagine’s approach is based on the use of plane wave insonification (Montaldo et al, 2009). A plane wave is generated by applying flat delays on the transmit elements of the ultrasound probe as illustrated on Figure 2. The generated wave insonifies at once the whole area of interest. The backscattered echoes are then recorded and processed by the ultrafast scanner to compute an image of the insonified area. Plane wave imaging allows the computation of one full ultrasound image per transmit. UltraFast imaging allows significant increase of the maximum frame rate achievable by an ultrasound system. Table 1 lists typical frame rates for different ultrasound clinical applications using conventional and ultrafast architectures. 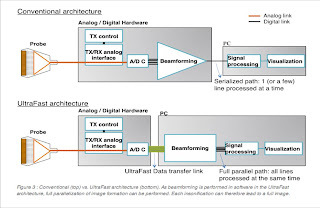 In UltraFast imaging, the beamforming computations must be performed on a fully parallelized architecture, typically based on a software platform. • The data transfer rate from the acquisition module to the processing unit. As raw (non beamformed) Radio Frequency (RF) signals are directly transferred to the PC, the data rate required to perform real time imaging is immense (several GigaBytes/s). • The processing unit needs to be powerful enough to ensure real time beamforming. As an example, conventional gray scale imaging requires 1 to 2 Gigaflops (multiplication+addition) per second. Figure 3 represents the architecture of an ultrafast system compared to a conventional one. Aixplorer is the first commercially available system to break these technological barriers and allows ultrafast imaging of tissue with frame rates up to 20,000 Hz. It relies on the use of powerful graphical processing units (GPUs) from the video game industry combined with fast digital links (PCI express technology) capable of transferring massive volumes of data to these units. The next section demonstrates how UltraFast imaging can be used to improve Doppler flow analysis by addressing important performance and workflow constraints of the currently available color and PW Doppler modes. The maximum number of angles that can be used to compute an image is limited by the acquisition Pulse Repetition Frequency (PRFDoppler) needed to measure the desired Doppler velocity scale (usually the velocity scale is set by the user). where PRFmax is the maximum PRF that can be achieved for a given imaging depth. Using UltraFast imaging, Doppler information is continuously and simultaneously acquired across the full image. Therefore, unlike conventional color Doppler acquisitions, all pixels are sampled at a high Doppler PRF in an uninterrupted and concurrent manner, offering the unique ability to perform full flow quantification at every pixel within the UltraFast color box. In a typical implementation of UltraFast Doppler, a single-shot acquisition can be launched from the conventional color Doppler imaging mode. A full clip of UltraFast Doppler data is acquired (typically 2 to 4 s) and the system is frozen. The user can then review the UltraFast color flow imaging clip, select the frame(s) offering best visualization of the flow properties of interest, and perform full spectral analysis at every pixel of the color box in a retrospective manner. Retrospective UltraFast spectral analysis offers for the first time the ability to compare flow spectra and measurements from multiple locations, which have been acquired simultaneously and therefore correspond to the same cardiac cycle and exhibit perfect temporal synchronicity. • A significant improvement of color flow imaging performance in terms of temporal resolution and sensitivity. 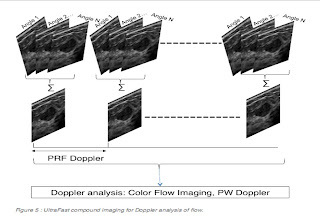 • A new Doppler paradigm by merging the color Doppler and PW Doppler modes in a single fully-quantifiable acquisition, which can simplify workflow, reduce exam time, and can enable advanced measurement and visualization capabilities. Conventional color Doppler imaging offers limited frame rates (typically 20 Hz) and suffers from severe trade-offs between color box size and temporal resolution. 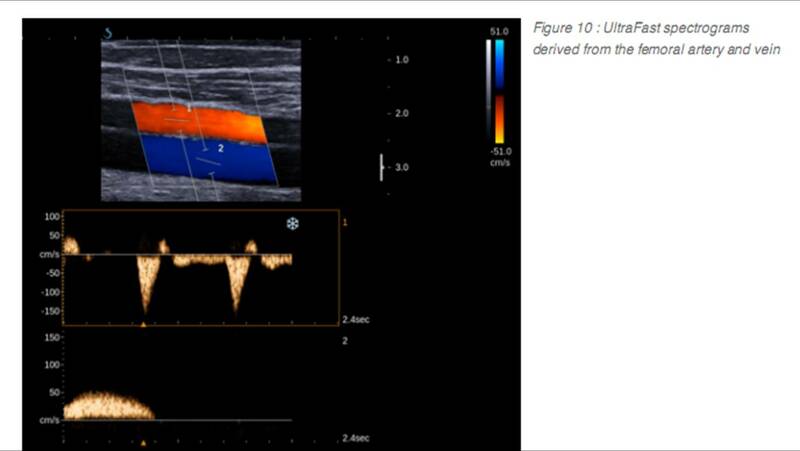 Figure 7 shows two conventional color Doppler frames from a femoral artery, plus the corresponding frames obtained by means of UltraFast Doppler. 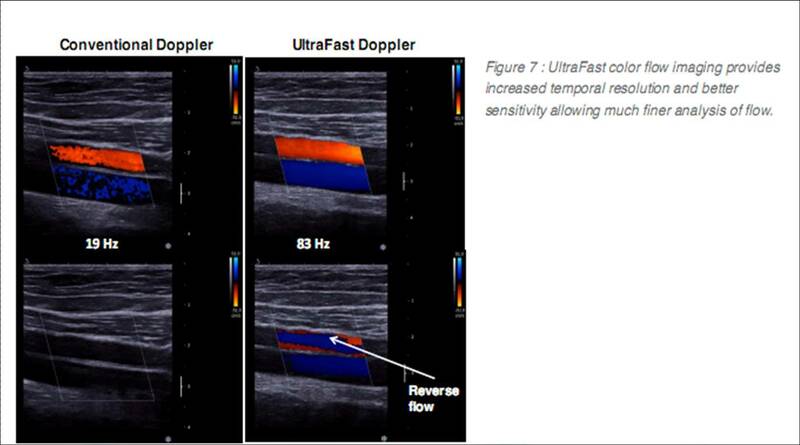 In this example, UltraFast Doppler exhibits excellent flow sensitivity, and provides frame rates of more than 80 Hz. On the other hand, conventional color Doppler imaging is limited to a frame rate of 19 Hz which results in insufficient sampling of the underlying flow dynamics, as illustrated by the bottom frames of Figure 7 where the reverse flow is perfectly documented in the UltraFast Doppler frame, but is completely missed by the conventional color Doppler acquisition. This example demonstrates how limited frame rates can induce a loss of information, something that can represent a major issue in the context of flow pathology. UltraFast Doppler enables frame rate increases by a factor of 5 to 10 compared to conventional color Doppler, typically from 60 up to 200Hz, without sacrificing field of view or spatial resolution. Thanks to these improvements, complex flow dynamics and transient flow event can be visualized in a much more accurate manner, potentially leading to a more reliable hemodynamic assessment of cardiovascular diseases such as stenosis. • Clips of color data can be generated with high sensitivity, and frame rates up to a factor 10 relative to conventional systems. • The increased quality is maintained regardless of the color box size. Conventional color Doppler suffers from trade-offs between frame rate and color box size. Using plane waves, the whole area of interest can be filled with color Doppler information without any drop in frame rate. sequentially acquired, so that the Doppler signals on the sides of the color box exhibit time lags that can reach several hundreds of milliseconds. In addition to increased flow imaging performance, UltraFast Doppler enables full quantification of flow data everywhere in the image. 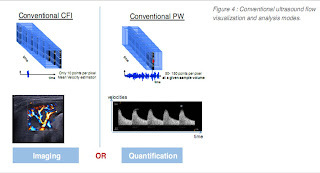 The user can position a sample volume anywhere within the region of interest and the system responds by instantaneously computing and displaying the PW spectrogram from the selected location. Up to three spectrograms can be calculated and displayed simultaneously on the image as illustrated in Figure 8. Measurements can be performed independently on all spectrograms and compared to each other with a high degree of reliability, since all spectra are computed from data acquired at the same time, on the same cardiac cycles. It is important to note that the results of UltraFast spectral analysis are numerically equivalent to those obtained by a conventional PW Doppler exam performed under the same conditions. 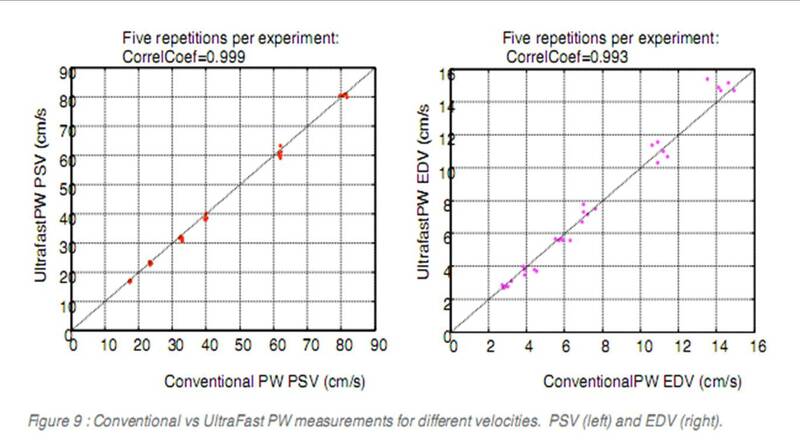 Figure 9 shows a comparison between peak systolic velocities (PSV) and end diastolic velocity (EDV) measurements in a flow phantom mimicking arterial flow for both techniques (Conventional PW and UltraFast Doppler). 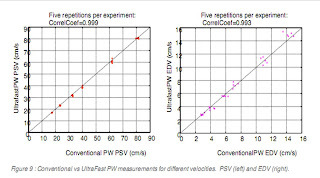 This comparison demonstrates that the PSV and EDV measurements show excellent correlation over a wide range of velocities. 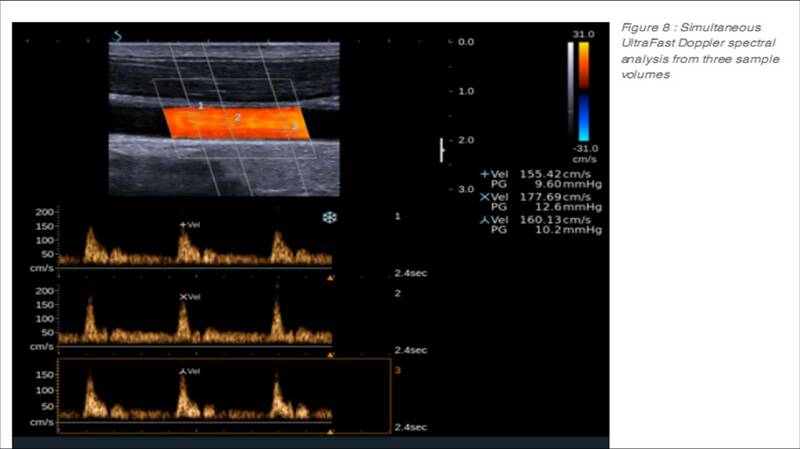 As a final example, Figure 10 displays UltraFast Doppler results from a femoral artery and vein (same case as Fig 7), depicting the arterial and venous flow corresponding to a given color frame (top), and documenting the full temporal evolution of flow within each vessel in the two UltraFast spectrograms (bottom). 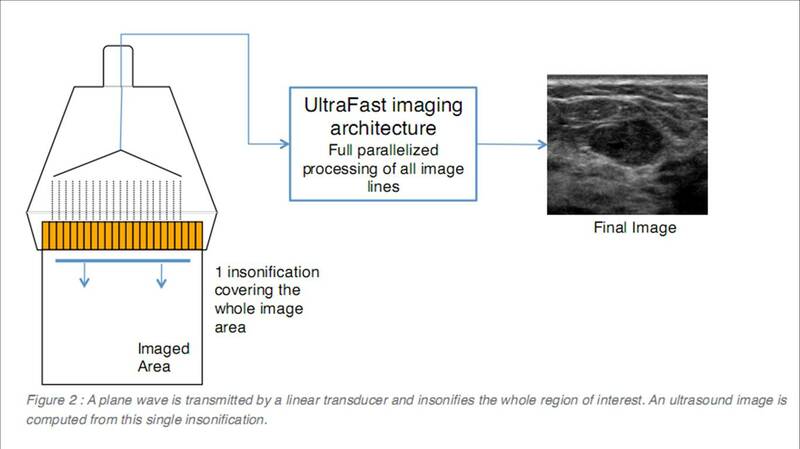 UltraFast imaging is a breakthrough technology that can offer significant performance improvements and innovative capabilities to the field of medical ultrasound. 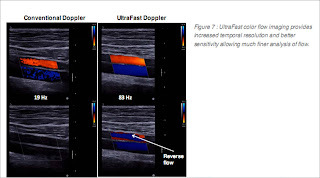 UltraFast Doppler is the combination of UltraFast imaging and Doppler techniques, which retain the advantages of color Doppler and PW Doppler without the respective disadvantages of each individual mode. UltraFast Doppler offers high-sensitivity and high-frame rate flow imaging allowing high-quality visualization of complex and transient flow events, plus the ability to perform accurate quantification and comparison of flow velocities through the whole image area based on full spectral analysis. 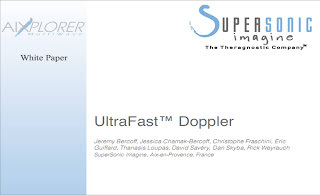 Due to these characteristics, UltraFast Doppler has the potential to significantly simplify the workflow of Doppler exams and reduce the time needed to complete them. 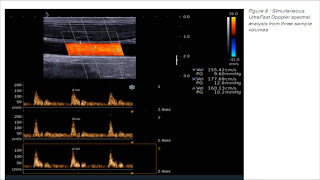 New UltraFast Doppler features and capabilities are currently under development, which will undoubtedly enhance the clinical utility of Doppler imaging even further. Trong UltraFast Doppler, một số sóng phẳng nghiêng [tilted plane waves] được truyền vào môi trường và các echo tán xạ ngược được kết hợp chung lại để tái tạo thành hình ảnh siêu âm (Bercoff et al, 2011). (Hình 3) Số lượng góc tối đa có thể được sử dụng để tính toán một hình ảnh bị giới hạn bởi tần số lặp xung (PRF Doppler) cần dùng để đo thang vận tốc Doppler mong muốn (thường là thang tốc độ được người dùng đặt ra). Hình 4 Trong ví dụ này, UltraFast Doppler thể hiện độ nhạy dòng chảy với tốc độ khung hình trên 80 Hz. Mặt khác, hình Doppler màu quy ước bị giới hạn ở tốc độ khung hình 19 Hz dẫn đến việc lấy mẫu không đầy đủ các lực dòng chảy underlying, dòng chảy ngược (reverse flow). Ví dụ này cho thấy tốc độ khung hình hạn chế có thể làm mất thông tin khi khảo sát dòng chảy bệnh lý. Thông tin Doppler trên UltraFast thu liên tục một lúc và trên toàn bộ các điểm ảnh (pixel).Trong thực hành, sau khi thu clip dữ liệu UltraFast Doppler (thường từ 2 đến 4 giây). Người dùng có thể hồi cứu, chọn (các) khung hình phổ tốt nhất và phân tích phổ đầy đủ ở mọi pixel của hộp màu. Điều quan trọng cần lưu ý là kết quả phân tích phổ UltraFast tương đương số lượng với kết quả khám PW Doppler quy ước được thực hiện trong cùng điều kiện. UltraFast Doppler đang được ứng dụng khảo sát các bệnh lý mạch máu trên người lớn và đặc biệt trên trẻ em .Do tốc độ thu tạo hình rất nhanh phù hợp thăm khám các bệnh nhi không hợp tác và bệnh nhân nín thở không tốt. Hình 6 A. Phổ sóng động mạch liên thùy thận ở cực trên-giữa-dưới trên bênh nhân nhịn thở không tốt. tiết kiệm thời gian thăm khám đối với Ultrafast Doppler B. Hình UltraFast Doppler trên trẻ sơ sinh 2 tuần tuổi không thăm khám được trên siêu âm thường. Hình 7 Hình ảnh khảo sát động mạch tĩnh mạch cơ tim trên phantom và động vật, tĩnh mạch có tín hiệu dòng chảy giữa tâm thu và đọng mạch vành thì giữa tâm trương. fUS (functional ultrasound) ứng dụng khảo sát chức năng thần kinh trên siêu âm khi kết hợp UltrasFast trên đầu dò 3D, 4D. UltraFast Doppler là sự kết hợp của tạo hình UltraFast và kỹ thuật Doppler, giữ lại những ưu điểm của Doppler màu và PW Doppler mà không có những nhược điểm cố hữu. UltraFast Doppler cung cấp hình ảnh tốc độ và độ nhạy cao, cho phép hiển thị trực quan các pixel nhanh nhất.Ngoài ra, việc định lượng và so sánh vận tốc dòng chảy trên cùng chu chuyển tim cũng là một ưu thế. Do những đặc điểm này, UltraFast Doppler làm đơn giản hóa đáng kể quy trình tham khám Doppler. Các tính năng và khả năng của UltraFast Doppler mới hiện đang được phát triển, điều này chắc chắn sẽ nâng cao tiện ích lâm sàng của tạo hình Doppler hơn nữa. 1) Provost, J. và các cộng sự. (2015), "3-D ultrafast Doppler imaging applied to the noninvasive mapping of blood vessels in vivo", IEEE Trans Ultrason Ferroelectr Freq Control. 62(8), tr. 1467-72. 2) Deffieux, T. và các cộng sự. (2018), "Functional ultrasound neuroimaging: a review of the preclinical and clinical state of the art", Curr Opin Neurobiol. 50, tr. 128-135. 3) Maresca, D. và các cộng sự. (2018), "Noninvasive Imaging of the Coronary Vasculature Using Ultrafast Ultrasound", JACC Cardiovasc Imaging. 11(6), tr. 798-808. 4) Hur, B. Y. và các cộng sự. (2015), "UltraFast Doppler ultrasonography for hepatic vessels of liver recipients: preliminary experiences", Ultrasonography. 34(1), tr. 58-65. 5) Osmanski, B. F. và các cộng sự. (2014), "Transthoracic ultrafast Doppler imaging of human left ventricular hemodynamic function", IEEE Trans Ultrason Ferroelectr Freq Control. 61(8), tr. 1268-75. 6) Cikes, M. và các cộng sự. (2014), "Ultrafast cardiac ultrasound imaging: technical principles, applications, and clinical benefits", JACC Cardiovasc Imaging. 7(8), tr. 812-23.